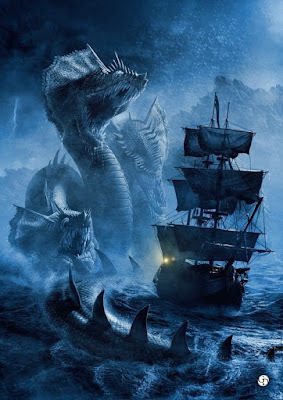 Ocean travel and its hazards are something that I've discussed on this blog quite often, albeit usually in terms of monsters. Many games include some rules for traveling and fighting on the water, but Fantasy AGE does not (yet). 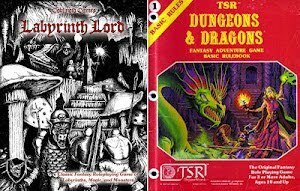 So, in an effort to fill a gap until some official rules appear, and to amuse myself by tinkering, here are some ideas about handling the perils of the deep in FAGE. Most threats will either be a straight up combat or a hazard. This means the PCs (and possibly the NPC crew) will simply duke it out with some aquatic beastie or have to deal with things like a storm or shoaling reefs, etc. For the former, it's a combat. GMs will want to keep in mind things like damage to the ship or cargo (or minor NPCs). A lot of that might be handled narratively. The sea serpent lashes out with it tail and breaks the mainmast like a twig. Maybe someone has to jump out of the way or get smashed, but otherwise it won't effect the immediate combat. Later on, the ship may be drastically slowed in its travels, but for now the monster is the problem. The captain will make Dex (Sailing) rolls. Each roll represents an hour's time. TN: The storms's intensity is not without its challenges, but well within a competent skipper's normal skills. Let's say 11. Max Rolls: The GM determines the storm lasts 5 hours. That means the captain must make the success threshold within that window (5 rolls) or it means he couldn't weather the storm and –depending on how far short he fell of the target– his ship and crew suffer the consequences. The GM can determine this as appropriate: Maybe they were merely blown off course. Maybe they were dismasted. Maybe the ship founders and sinks. Another situation that might arise is a ship to ship action. Perhaps pirates attack the merchant vessel that the PCs have booked passage upon. Maybe the PCs are the pirates! If the goal of each ship is the same but conflicting, i.e. to attack the other, then opposed sailing rolls by the captains will suffice for maneuvering. Modifiers can be given for things like advantageous positioning (the weather gage) or a ship's sea/battle-worthiness. A win in the opposed roll gives the victor some edge that turn in the fight. Maybe stunt points to those who are actually fighting. Gunnery (or catapults, etc.) are their own attack rolls. GMs could also allow the winner to describe some narrative effect based on the degree of success (stunt die result). Another tack (Heheh. Get it?) is to use opposed, advanced tests. This could be especially useful if one ship has a different goal from another. e.g. escape vs. attack. Each captain declares what their goal is and then the GM sets the success thresholds and TNs. The interval between rolls (time) is determined by the nature of the goals, distance from each other, etc. (probably at least several minutes for each roll in a sailing ship scenario). Each captain rolls –probably Dex (Sailing) or Int (Navigation), but it would depend on the goal– each captain can theoretically succeed in a turn, but the one who succeeds by the greater margin gains an addition +1 toward their threshold. GMs can also enforce a cap on a captain's rolls like in the storm example if it makes sense. Maybe the pursuing ship must catch its quarry before they can reach the harbor. Perhaps one ship is trying to get through a treacherous reef before night falls while the other ship races around through open water to cut them off on the other side. Who knows? Whichever ship that reaches its threshold first wins the contest and the results can be handled narratively. Of course, the result may lead to a new contest or conflict. The chase ends in a boarding action and combat. These types of contests are probably best in situations where the PCs have some say in how things are handled. If the "captain" of the party's ship is an NPC, have one of the players roll for him. You (the GM) may tell them what the captain wants to do ("We can't win a stand-up fight, we have to flee!" or "If we can force them into the shallows, their heavier draft will run them aground!") but the players need some agency. Of course, if the party is in command, let them make their choices. They need to appoint one PC as the commander for the contest. Sailing ship actions depend on coherent orders given definitively and carried out obediently. The other players can have their PCs doing things like firing arrows at the other ship. They might assist the captain as well. 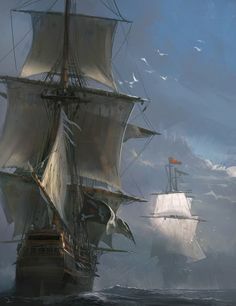 A character with the Com (Morale) focus might inspire the crew to hop to it, or a mage might cast the Wind Blast spell to give the sails a gust of speed. Such actions might grant +1 assist to the captain for a turn or two. One could fill chart after chart with different variations of wind and currents and turning radiuses, but I'm trying for something a little more abstract here. Likewise I'm not describing multiple ships from various eras or cultures. I'm not trying to quantify hull AR or health points or speeds and so forth. Most of that might be useful in a wargame or a scenario where the point of it was to determine a real naval battle or ship action in terms of crews, armaments, and ships, but I'm just trying for some ideas on how to run an adventure on the open waves.